Over a span of two decades, warming temperatures have caused annual losses of roughly $5 billion for major food crops, according to a new study by researchers at the Carnegie Institution and Lawrence Livermore National Laboratory. 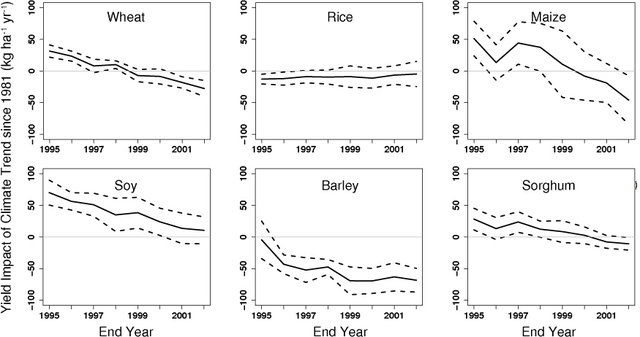 From 1981-2002, warming reduced the combined production of wheat, corn, and barley by 40 million metric tons per year, according to the analysis published today in the online journal Environmental Research Letters. The results suggest that recent climate trends, attributable to human activity, have had a discernible negative impact on global production of several major crops. The impact of warming was likely offset to some extent by fertilization effects of increased CO2 levels, although the magnitude of these effects are uncertain and the subject of much debate. If each additional ppm of CO2 results in ~ 0.1% yield increase for C3 crops (a yield increase of 17% for a concentration increase from the current 380 ppm to the frequently studied 550 ppm), then the ~ 35 ppm increase since 1981 corresponds to a roughly 3.5% yield increase, about the same as the 3% decrease in wheat yield due to climate trends over this period. Thus, the effects of CO2 and climate trends have likely largely cancelled each other over the past two decades, with a small net effect on yields. This conclusion, while tempered by the substantial uncertainty in yield response to CO2, challenges model assessments that suggest global CO2 benefits will exceed temperature related losses up to ~ 2° warming. The study is the first to estimate how much global food production has already been affected by climate change. Christopher Field and David Lobell compared yield figures from the Food and Agriculture Organization with average temperatures and precipitation in the major growing regions. They found that, on average, global yields for several of the crops responded negatively to warmer temperatures, with yields dropping by about 3-5% for every 1° F increase. Average global temperatures increased by about 0.7° F during the study period, with even larger changes in several regions. "Though the impacts are relatively small compared to the technological yield gains over the same period, the results demonstrate that negative impacts are already occurring," said study author, David Lobell. The researchers focused on the six most widely grown crops in the world: wheat, rice, maize (corn), soybeans, barley and sorghum—a genus of about 30 species of grass raised for grain. These crops occupy more than 40% of the world’s cropland, and account for at least 55% of non-meat calories consumed by humans. They also contribute more than 70% of the world’s animal feed. The main value of this study, the authors said, was that it demonstrates a clear and simple correlation between temperature increases and crop yields at the global scale. The Carnegie Institution of Washington has been a private nonprofit research organization since 1902. It has six research departments: the Geophysical Laboratory and the Department of Terrestrial Magnetism, both located in Washington, DC; The Observatories, in Pasadena, California, and Chile; the Department of Plant Biology and the Department of Global Ecology, in Stanford, California; and the Department of Embryology, in Baltimore, Maryland. This study indicates that the potentially positive affect of increased atmospheric concentrations of CO2 on crop yields will largely be offset by decreased yields resulting from increasing temperatures. If this study's findings are correct, then one of the few bits of 'good news' concerning global warming - potentially increased crop yields - is largely overstated. Crop yields will also likely be impacted as climatic zones suitable for agriculture - the traditional bread baskets of the world - shift to lower latitudes, necessitating a gradual relocation of farming activities. Increased and more severe summer droughts, also a likely affect of global warming, will further take it's toll on agricultural activities. These two likely effects of climate change will disproportionately impact those in poorer developing countries who lack the resources needed to cope with shifting climate zones and increased drought (and desertification) - i.e. increased water storage and irrigation and the relocation of farms to more productive climatic zones. All-in-all, despite some potential increases in crop yields driven by higher atmospheric concentrations of CO2, global warming looks like bad news for the world's agricultural operations. I didn't want to comment originally, but I think there's something useful to add. This study assumes no adaptation of any sort (let's call that adaptation level zero). There's an optimum growth temperature for crops, and when current crops are close to that, any change, either up or down, will reduce yield. A simple level of adaptation is to consider growing different crops (varieties of the same crop that have a slighter higher optimum temperature), and to make other simple changes (say to fertiliser use or crop rotation patterns). Let's call that adaptation level 1. Up to this point of adaptation, farmers continue farming the same land. For adaptation level 2, we assume that some land is abandoned and other land is brought into production. I think the consensus is roughly that adaptation level 0 is equivalent to little gain from CO2 even at minuscule temperature rises, and significant losses at modest temperature rises (say 2-3C), and very significant losses for very high temperature rises (say above 6C). For adaptation level 1, there are modest gains for small temperature rises and some gains up to around 3C, but beyond that there are modest to significant losses. For adaptation level 2, there'd be gains even for very high temperature increases. But that is built on assuming that it's ok for Indian production of grain to head towards zero in 2150, (them focusing on some high value irrigated tropical fruits and vegetables instead say), and in turn Siberia becoming a bread basket.